Royal Challengers Bangalore 189-3 (Tillakaratne Dilshan 76*, AB de Villiers 59*, Brad Hogg 2-39) beat Rajasthan Royals 143-7 (Rahul Dravid 58, Stuart Binny 20*, KP Appanna 4-19) by 46 runs. The fourth wicket partnership of 122 runs off 46 balls led by AB de Villiers, well supported by Tillakaratne Dilshan sunk Rajasthan Royals in the IPL 2012. The duo remained unbeaten,Tillakaartne Dilshan laid a solid foundation while opening the innings and scored 76 as AB de Villiers crushed the Rajasthan Royal bowling by smashing 59. Royal Challengers Bangalore hammered 189 runs for the loss of just three wickets at the close of the 20th over and Rajasthan Royals were restricted to 143 runs for the loss of seven wickets. 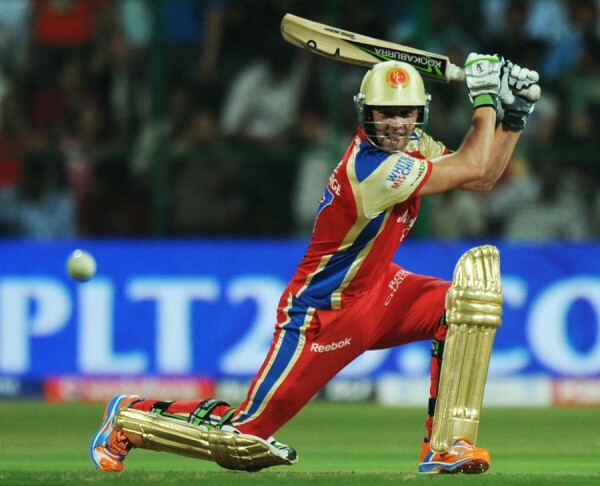 AB de Villiers (Royal Challengers Bangalore) was declared ‘Player of the match’ for his astonishing knock of 59 off just 23 balls. 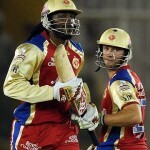 The 30th match of the Indian Premier League 2012 was played at Sawai Mansingh Stadium, Jaipur, on Monday, April 23, 2012. Earlier, the captain of Rajasthan Royals, Rahul Dravid won the toss and offered the batting to Royal Challengers Bangalore. The out of form, Virat Kohli was promoted up in the order to open the innings with Tillakaratne Dilshan as the first started off well by getting two fours in the second over. Dilshan was not taking any risks and they accumulated 23 runs in the first three overs as the poor form of Kohli continued and he was caught by Brad Hodge off Pankaj Singh on the fourth ball of the fourth over. The incoming batsman, Mayank Agarwal was dropped by Stuart Binny at extra cover off Kevon Cooper for one run. Dilshan took over the command as a couple of wickets fell at the other end and Royal Challengers Bangalore were at a critical stage for 67-3 wickets in 11.4 overs. AB de Villiers joined in next and opted to attack by dispatching two sixes in the 13th over off Ajit Chandila as Dilshan was heading smoothly at the other end. The duo accelerated the run rate as Dilshan scored his fifty in the 16th over and never looked back. The boundaries started sprinkling from the woods of two batsmen as de Villiers punished Siddharth Trivedi in the 19th over for 19 runs with two grand sixes and one four and achieved his fifty as well. They amassed 189 runs without any further loss by the end of the 20th over which was an excellent score on such wicket. Tillakaratne Dilshan remained unbeaten for 76 off 58 balls with one six and 10 fours as AB de Villiers was at the other end with 59 from just 23 deliveries assisted with 5 towering sixes and 3 fours. Brad Hogg was the most successful bowler with two wickets and Pankaj singh claimed one. Rajasthan Royals initiated the innings with Rahul Dravid and Ajinkya Rahane and the first entered in with an aggressive approach by throwing the ball out of the fence once in the first three overs. The sixth over resulted in 13 runs which included three fours by the duo and the first fifty of the innings was accumulated on the first ball of the seventh over. Rahane was gone on the second ball of the eighth over for 13 runs as Owais Shah came in the centre but found it difficult to force the pace of scoring. The bowlers of Royal Challengers Bangalore made the life difficult for the Rajasthan Royals batsmen and especially KP Appanna became unplayable. Dravid reached his fifty with a four on the last ball of the 11th over as the wickets kept on sliding with a little assistance from the other end. Rahul Dravid became the sixth victim when he was caught by Dilshan at extra cover for 58 off 42 balls with 8 fours. Stuart Binny made some valiant efforts in the late order by scoring an unbeaten 20 off 18 balls with two fours as Rajasthan Royals managed 143 runs for the loss of seven wickets when the last ball of the 20th over was bowled. KP Appanna was the star performer with the ball by grabbing four wickets, Harshal Patel got two and Zaheer Khan held one wicket. Rajasthan Royals – 8 from 8 games at run rate of +0.190. Royal Challengers Bangalore – 8 from 7 games at run rate of -0.192.